Does your kid use secret entrances to get into the house when he comes home from school? Do you catch him designing and building complex gadgetry and weapons systems with the family's elderly British butler? Does he seem even more dark, mysterious and internally conflicted than the average kid? Then he's probably a vigilante of the night, a caped crusader who prowls the streets dealing justice to evildoers and menacing clown-types. That's why this awesome Tween Dark Knight Rises Batman Costume is the only one for him this Halloween. Because for your young hero, it's not just a costume... it's a way of life! This getup has all he needs to get him going. That includes a black jumpsuit with gray accents that create the armored look of Bruce Wayne's batsuit, a polyfoam utility belt, and a black cape that attaches easily with Velcro. It also comes with those wicked arm spikes, and of course, Batman's signature mask. A pair of boot covers are also part of the package, assuring that your kid will be a hero from head to toe. When Bane invades town, young Master Wayne will be ready for him. 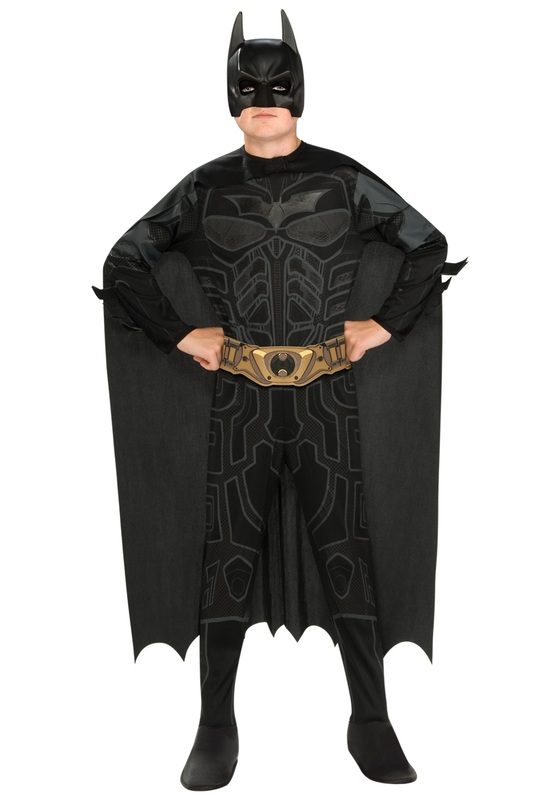 Whether his ride is the actual batmobile or just the family sedan (piloted by his loyal and trusty parents), he'll be the Dark Knight in this Tween Dark Knight Rises Batman Costume. So give him the chance to suit up as Batman this Halloween... because your kid is the hero Gotham (or even just your immediate neighborhood) deserves!